Adi Shankara( c. 788 A.D. – c. 820 A.D. ), the founder of the Non-Dualist or ADVAITA School of Indian Philosophy has shared his ideas about human soul or spirit which is called ATMA or ATMAN in Indian Sanskrit language. What is the Truth about Soul or Spirit? Truth is the quality of being in accordance with experience, and verified facts. Truth or Reality can be established by using a reasoning process called verification and validation. To verify or refute a theoretical claim, we need to clarify statements by demonstrating relation between the theoretical claim and the observational evidence. Such a reasoning process could be applied in two manners; 1. The Coherence Theory of Truth, and 2. The Correspondence Theory of Truth. According to the Coherence Theory of Truth, the standard of Truth is the logical consistency of a proposition with a large system of propositions. According to the Correspondence Theory of Truth, Truth is viewed as a relation between an idea or proposition and its object. To verify Truth or Reality, the Subject and Object of an idea or proposition must have a relationship. Truth when applied to statements or ideas is related to the validity of what we mean and hence it requires correspondence between thought and external reality. It is true that man has the biological ability and capacity called ‘imagination’, but man may not have the ability and capacity to translate the act and power of imagination into actuality, an external experience that could be observed by others. In my imagination, I can seek the existence of an all blissful entity called ‘SHIVA’ while in actuality, I exist in the physical world as a fragile, mortal being. Religion, Philosophy, and Science may represent three distinct fields of learning about Truth and Reality. Scientific knowledge not only provides the knowledge that something is true, but it also provides the reason why it is true. Religion, and Philosophy could use different methods to study Truth and Reality, but the ideas they share require verification, corroboration, and validation. In the study of man, the know-er and the known are one. Man is the observer and the observed fact is that of man’s nature. If man has to know the truth about his self, man has to understand the truth and reliability of his own cognitive powers. If the Subject called man is identified as an Object called Soul, or Spirit, the Truth or Reality of Soul, or Spirit involves a structural/functional relationship between the Subject and its Object. Adi Shankara ( c. 788 – c. 820 A.D. ), the founder of the Non-Dualist or ‘ADVAITA’ School of Indian Philosophy called ‘VEDANTA’ has shared his ideas about human Soul, or Spirit or ‘ATMA’ or ‘ATMAN’ in Indian Sanskrit language. In six short poems popularly known as ‘Nirvana Shatakam’, or ‘Atma Shatakam’, he has presented his mental concepts about human Soul, or Spirit which he called “AHAM”(Subject ‘A’) . 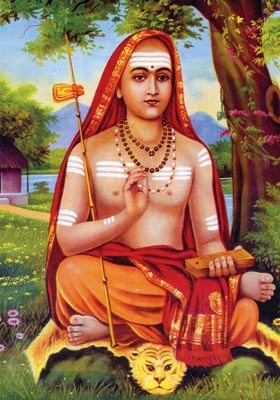 Adi Shankara is primarily concerned about establishing the perfect Identity between this Subject ‘A’ and its Object called “CHIDANANDA SHIVAM(Object ‘C’). However, Adi Shankara makes no attempt in his propositions to establish the basis for this Identity between the Subject ‘A’ and its Object ‘C’. Adi Shankara is proposing that the Subject ‘A’ or ‘AHAM’ has no structural, functional, mental, moral, social, and spiritual relationship with its human body or ‘B’. In his view, the human soul or spirit is not involved, and is not concerned with the existence of human body in which the soul or spirit is thought to be residing. In an effort to establish the school of thought called “ADVAITA” or Non-Dualism, he systematically separates the human body from its human soul. Adi Shankara has further extended this proposition to claim that the Subject ‘A’ is the same as the Object ‘C’ and the reason he has given is that of a lack of relationship between Subject ‘A’ and the human body ‘B’. Since, ‘A’ is not the same as ‘B’, ‘A’ is not equal to ‘B’. And, therefore, Adi Shankara claims that ‘A’ is the same as ‘C’ or ‘A’ is equal to ‘C’. He has not stated that there is or there could be a structural, functional, mental, moral, social, and spiritual relationship between ‘A’ and ‘C’. If such relationship exists between ‘A’ and ‘C’, Adi Shankara has not presented any observational evidence in support of his claim that states ‘A’ = ‘C’. Let us briefly review the six verses. Kindly note that the verses are composed in Indian Sanskrit language and there are several minor variations in the words that are attributed to Adi Shankara. The word ‘NIRVANA’ means ‘MUKTI’ or Release( the release of the conditioned human soul ), death, Sunset, and conclusion of an event( such as the end of Life ). I must clarify that ‘death’ may not be viewed as a static, or final event. Death is a dynamic event like Life which is characterized by changes like growth and development and various stages like infancy, youth, man, and old age. Just like Sunset which is followed by Sunrise, the event called death is followed by regeneration, renewal, and rebirth. Living organisms arrive with a plan for their own dissolution and such organic decay and decomposition is influenced by the cyclical flow of Time. CHIDANANDA RuupaH ShivO Aham, ShivO AHAM. Adi Shankara excludes the four mental functions known as Ma-nah( the seat of thoughts and imagination, the chief sense organ called Mind), Buddhi(the seat of intellect and knowledge), Chitta(the seat of emotions such as compassion, affection, and devotion), and Ahankara(the seat of ego, self-pride, the sense of pride that is associated with the recognition of ‘SELF’ or ‘I’ as existing or living) as the basis of his true Identity or Essence(What you are). These four aspects of mental activities are described in Indian tradition as “ANTAH KARANAM” or ‘MANO CHATUSHTAYAM”. The human nature which is known as “CHITTA” or “HRUDAYA”, “KARUNA”, or “DAYA” and “BHAKTI” is recognized as Compassion, Kindness, and Devotion; the mental qualities that are needed for formulating Spiritual relationships both within the Individual and between Individuals. Adi Shankara gives no reason for this separation of human nature from its human Soul. Similarly, he excludes the five organs of Sense Perception( often described as “JNANA INDRIYAS”, the organs that provide sensory information and sensory experience ) such as ears, tongue, nose, eyes, and skin and the Five Primordial Elements described in Indian tradition as ‘Pancha Maha Bhutas’ such as Sky, Earth, Fire, Wind, and Water. He thinks that they are not truly related to his True Identity and Essence. He is specifically excluding all known material substances, material structures and forces that operate in the natural world in the description of his True Identity. In my view, I consider that man comes into existence as a newly created object, one of its own kind, original, and distinctive who could always be identified as a specific individual. I claim that man is a created being and man has no choice other than that of existing as an Individual with Individuality. The physical form, the morphological appearance of man always makes him unique and it has to be explained and accounted for. I suggest that human Soul is the internal reality; and Soul is the basis for human Individuality and the Soul is the unchanging principle that allows man to exist with changing external forms with specific physical attributes. Chidananda RuupaH, ShivO AHAM, ShivO AHAM. Adi Shankara also refers to the five organs of action that are described in Indian tradition as “KARMA INDRIYAS” which are the five instruments of Speech(VAAK), Hand-Grip and Manipulation(PAANI), Locomotion( PAADA), Procreation(UPASTHA) and Excretion(PAAYU). Adi Shankara has not bothered to state as to how these different organs and organ systems could function together to support the existence of the human person who lives because of those varied living functions. Life is nothing but to function and in my view, the human Soul is the central element that generates the structural and functional coordination that is required for human existence. CHIDANANDA RuupaH, ShivO AHAM ShivO AHAM. Adi Shankara correctly claims that the human Soul may not contribute to human feelings, and thoughts associated with hatred, sexual passion, greed, arrogance, and envy or jealousy. At the same time, he rejects the traditional Indian view about man’s purpose in Life; the purpose of Right Action or “DHARMA”, the purpose called earning money or material wealth to support Life or “ARTHA”, the purpose of Procreation or “KAMA”, and the purpose called God-Realization, Liberation, or “MOKSHA”. In other words, Adi Shankara is suggesting that human life and human existence may have no underlying purpose. He is also not giving any coping mechanism to deal with the problems associated with human emotional experiences like passionate desires. Indian tradition consistently recommends that man can exercise self-control as the human Soul is superior to human mind, human intellect, and human sense organs. If human body has no structural or functional affiliation with its human Soul, it will not be likely that man can exercise self-restraint and self-control. In my view, man, the Mental Being can establish himself as a Moral Being using the discerning ability to make the distinction between right and wrong, and distinguish good from evil by knowing the existence of the Knowing-Self or the Soul. Adi Shankara is describing that he has no sense of attachment to the consequences of his actions either good(“PUNYA”) or bad(“PAAPA”). He is recommending that man need not perform temple worship, and there is no need to observe religious rituals, sacrifice, and perform acts of pilgrimage. He is rejecting the desire to seek pleasure and comfort(“SAUKHYAM”) and he may not be able to totally avoid the pain, misery, and the experience of suffering(“DUKHAM”). He specifically undermined the role of food and its five functions in support of human existence. The problem is that of the nature of human existence. In my view, man at any given age, in any given condition, under all given circumstances including good health or ill-health depends upon the Power/Energy/Force called MERCY/GRACE/COMPASSION. Man is not in control of his own existence. Man needs a guiding, and controlling force called the Divine Providence. In my opinion, the human Soul operates as the Connection between man and the Divine Providence that supports, sustains, and preserves human existence irrespective of man’s experience of pain or pleasure. Man has no choice other than that of seeking Mercy, Grace, and Compassion that is called “KRUPA” in Sanskrit language. Adi Shankara very boldly asserts that he is without a trace of doubt(“SHANKAA”) and further adds that the Soul that he calls “AHAM” has no Father, or Mother. Indian tradition calls Father(“PITAA”) as the originating principle, and Mother(“MAATAA) as the sustaining principle. In my view, the human Soul comes into existence(“JANMA”) because of the Supreme Will or the Supreme Soul which is the Prime Cause, the Cause of all types of things and all kinds of Existence. The human Soul is conditioned and is not totally independent and hence, the human soul still needs a Divine Mother Principle to maintain its Spiritual Condition and Spiritual Existence. In this final or sixth verse, Adi Shankara tries to eliminate the classical dualism that is called the dualism of Universal-Particular. He claims that his human Soul or “AHAM” is universal entity that is limitless, formless(“NIRAAKAARA”) and is without any attributes or attachments(“BANDHAH”). In his view, the human Soul is essentially free; it is everything, everywhere, every time and is always in a state of equilibrium. He has stated this view without a trace of doubt(“NIRVI KALPA”). I would like to suggest some caution and ask my readers to recognize the importance of separation between the human soul and the Ultimate Reality. I can understand that there is no disunity between man and his Creator. I would ask my readers to know the philosophical system of thought called ‘NOMINALISM’ that does not grant universality to mental concepts outside the mind. Universality could be applied only to words or “nomina”, mental habits, or concepts. Nominalism only maintains the objective existence of the concrete, individual thing. It denies all objectivity whether actual or potential to universals. The human soul is attached to the human being and the human being has his existence on planet Earth and hence is not an universal entity. Since the human condition demands existence only on planet Earth and not the rest of the universe, the human Soul cannot escape from its conditioned status while it exists as a human Soul. The Universal Soul as proposed by Adi Shankara is just a mental concept and it can only exist in the mind of the man and it may have no correspondence with the facts of external world and the Universe. WHAT IS TRUTH, WHAT IS ILLUSION??? SPIRITUALISM AND SOUL – WHAT IS TRUTH AND WHAT IS ILLUSION??? Brahma is the Only Truth, the World is Illusion, and there is ultimately no difference between Brahman and Individual True Self. My question is: “WHERE DOES THIS TRUE SELF EXIST? WITHOUT EXISTENCE, THERE IS NO ESSENCE. ONLY WHEN A THING EXISTS, IT CAN DEFINE ITS ESSENCE. 3. When it is Existing? 4. Where it is Existing? 5. Why it is Existing? If the Subject ‘A’, or “AHAM”( I AM ), has no size, no shape, and no form, how could we establish the fact that ‘A’ is existing? Adi Shankara has not categorically stated the place or site where ‘A’ could be existing. If ‘A’ is existing, we may like to know the purpose of this existence. If there is a purpose for the existence of ‘A’, the question would be, What is that purpose? How is the nature of ‘A’ or the nature of ‘C’ is related to its purpose? The Truth and Reality about human Soul, or Spirit can be verified, can be corroborated, and can be validated by knowing the structural, functional, mental, moral, social, and spiritual relationship, partnership, connection, association, or bonding between ‘A’, ‘B’, and ‘C’. Indian tradition suggests that human body has three aspects; “Tri-ani-pada”, or three-in-one; and the three aspects of human body are, 1. Causal, 2. Spiritual, and 3. Material. There is a material connection between ‘A’, ‘B’, and ‘C’, if the human body has a ‘causal, and a ‘spiritual’ dimension. It would be very interesting to note that Adi Shankara has specifically avoided to describe the connection or relationship between the human Soul and human Consciousness. In Sanskrit language, Consciousness is called “CHETANA” and this term is not used in any of the six verses. Indian tradition believes that consciousness is the evidence for the presence of the human Soul and there is a structural and functional relationship between Soul and the Living Entity that is Conscious. We need to explain the concepts of Subject-Object, Appearance-Reality, Perceptual-Categorical, Immanent-Transcendent, Regulative-Constitutive, Conditioned-Unconditioned Dualism in respect of man’s existence and man’s status in Nature. In the context of human existence, the human Soul, or Spirit belongs to the Immanent Realm. 1. Place of Birth: Mylapore, Madras City, Chenna Patnam, Chennai, Madras State, Tamil Nadu, India. Born Hindu( Brahmin, Niyogi, Smartha), Telugu-Speaking. 2. Date and Place of Marriage: January 29, 1973. Congregational Town Church, Cuddapah, Kadapa District, Andhra Pradesh, India. Pingback: WHAT IS LIFE – LIFE IS KNOWLEDGE IN ACTION | Bhavanajagat. Pingback: SPIRITUALISM AND IDENTITY – THE CONFLICT AT KURNOOL MEDICAL COLLEGE | Bhavanajagat.